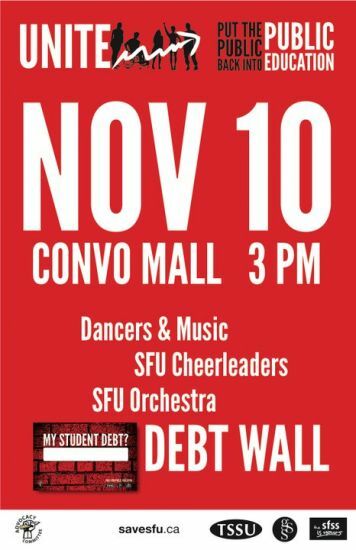 Next Wednesday, November tenth, SFU Students will be gathering in the central campus convocation mall to protest against the high costs of university education. The protest is called UNITE for Public Education and will begin at three O’clock pm. 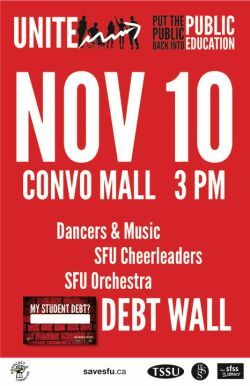 The protest is being organized by a diverse range of groups on campus, including the Simon Fraser Student Society, The Graduate Students Society, and the Teaching Support Staff Union. Worm’s-Eye View spoke with one of the protest organizers, Kyle Acierno. Kyle is the External Relations Officer of the Simon Fraser Students Society. Peter began by asking Kyle about what problems students face with the BC student loan system. This interview was first broadcast on Worm's-Eye View: Grassroots News, on CJSF 90.1 FM. Worm's-Eye View brings alternative, community-oriented social justice programming to the Lower Mainland of BC. We broadcast live every Friday from 10 to 11am, PST. It is a right for all Canadian citizens to attend post secondary education free of charge. The Canadian government is making money off of us every minute solely based on the fact that we are Canadian citizens with a Birth Certificate.